"on the wings of love". . . bewitching and majestic, all doubt is suspended as we see the wings unfold, transporting us to a land where time has forgotten . . .
Wild and free, a breathtaking beauty, the meaning of the Pegasus represents attaining ultimate freedom, with no boundaries of time and space. Ahhh, to thunder across the lands, to fly among the clouds, soaring over the oceans reaching lands that have yet to be explored, yet to be discovered, this is the power of freedom the Pegasus reveals to us. This magnificent creature comes to us in our time of greatest need, to lift us above the ordinary to take us to experience something extraordinary, to places and times that are alive in the dreams of our hearts. Pegasus brings the sacred blessings of lifting sadness and sorrow, and opens the way to new heights of joy and laughter and states of bliss. Q: What does the Pegasus Horse represent? A: Pegasus is a sign to go beyond your perceived limitations, to connect to your innermost dreams, that of the child within that is calling to be recognized and brought forth. Spiritually, the Pegasus symbolizes living the life we were born to live, without restraints or fears of being judged ~ Pegasus invites you to close your eyes for just a moment and imagine the life that you feel you were born to live. Pegasus represents living life at our highest vibration where the doors of possibility are flung wide open. When we are living from the essence of who we truly are, our vibration soars. . . we feel as if anything is possible, we feel as if we can fly through the skies on the wings of love . . . just like Pegasus. Pegasus, the beautiful winged horse reminds us that ultimately we were born to experience and express happiness and freedom. To go deeper into the understanding of the symbolic meaning of the Pegasus, be sure to study the symbolism of the Horse. The ancient myth and lore of the Pegasus speaks to us of great inspiration. The Pegasus is a prominent symbol of inspiration in poems, stories and literature woven in stories throughout history. The great winged horse comes to us from Roman and Greek mythology, known for the attributes and symbolic powers of improvements in fortune and wealth, as well as being a good omen for new opportunities. In Greco-Roman legend Pegasus was the child of Poseidon, and linked as a friend of the Muses. In addition to symbolizing inspiration, wealth and fortune, Pegasus is known as the divine stallion, making an ascent to heaven upon his birth. After making his ascent to heaven Pegasus was given the task by Zeus to bring the power of lightening and thunder from the skies of Olympus. Ancient legend also tells us the Pegasus carried thunderbolts for Zeus. The etymology and legacy of Pegasus is discussed here. Where there is magic. . . there is sure to be a Pegasus, and where there is a Pegasus. . . there is sure to be magic! Pegasus represents magic at the highest level, for the highest good. Pegasus is a perfect symbol for the law of attraction and aligning to our greatest good and therefore our greatest potential ~ that of our higher self. When we align to our greatest good, that which is in accord to our higher self, we naturally attract and manifest the things that we "think" are out of our grasp. But. . . when in alignment with our higher self, these things just seem to "magically" appear, to to come to us "as if by magic". So, if the Pegasus is a representation of our highest self, then he symbolizes that the manifestation of the life we were born to live is indeed within our grasp, but for that to happen our priorities and intentions must all be in total sympathetic vibration. Pegasus therefore symbolizes harmony of "being" ~ where heart, mind, spirit and soul create a beautiful symphony of resonant notes. As I dig deeper into the symbolism of Pegasus as a spirit guide, I find that legend shares the tale that each time the winged horse struck his hoof to the earth, a fountain of a water spring burst open. This is a beautiful representation symbolizing the eternal springs and the fountains of youth and beauty. Pegasus is one of the most striking and elegant symbolic depictions of beauty and strength combined, he represents the male form in his full glory. It's no wonder he has a bond with the most beautiful and magical females on the planet ~ the Muses! With Pegasus, love is in the air! He brings powerful influence in both love and relationships. Being a symbol of romance, of allure and sexuality ~ with the power to create an unforgettable encounter. Be sure to invite the energy of Pegasus on your honeymoon! This power of love is so strong he can inspire new levels of devotion to an existing relationship, or infuse sizzle and attraction in an amazing secret crush, not to mention the romantic secret rendezvous. With all of this love energy, it's no surprise that Pegasus is a powerful influencer to attract and to lure a new love or new energies of romance. Work with Pegasus in your love attraction rituals and meditations and you will find new doors of romance being flung wide open ~ as if my magic! When you dream of Pegasus, or if you see a Pegasus in meditation you are dreaming of opening yourself to the extraordinary, and I do mean the extra~ordinary!! A dream of Pegasus exposes the dreams of the child ~ and to bring the dreams of the child to fruition. What were the dreams for your life as a child? This is what Pegasus has come to help you uncover and manifest. When you had these dreams for your life as a child you only thought about how the fulfillment made you feel, you didn't worry about the "how". 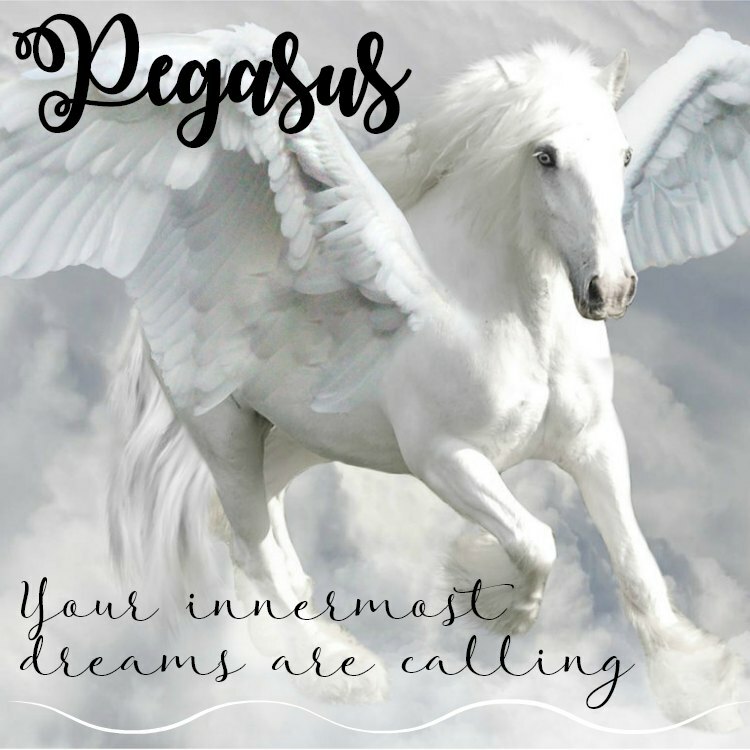 Pegasus now is an ambassador from the spirit realm bringing forth the essence to set your spirit free, to embrace the quest of your most precious dreams ~ knowing that if it is a dream for you it is not beyond the realm of possibility. Pegasus says. it is NOW possible, but to manifest it into your reality you must suspend all current beliefs that don't support your dream. You can access your superpower in the freedom of transporting yourself to another realm ~ the realm of possibility and belief. Pegasus comes to you in your dream and asks you to escape from the ordinary and enter the extraordinary ~ rising above obstacles where you can see the path to the fulfillment of your dream. Pegasus totem energy in a dream speaks the power of the dreams of a child and bringing them to fruition. The truth is always within beneath the surface ~ similar to the Pegasus striking land and bringing forth a spring. Pegasus is typically depicted as white, white being the manifestation and essence of purity and grace of the highest vibration, which is how he entered heaven . Sometimes Pegasus is black in color, this represents the deep mystery of the vast expansive realms of the Universe ~ the mystery is larger than we can conceive.